Parade just named Musicians Belt as one of the top 12 holiday gifts for musicians for 2017. Here's what they had to say. If you play an instrument you know you don’t want to wear anything that might scratch the finish while you’re gettin’ down on stage. Enter the Musician’s Belt. Ingeniously crafted in the USA, this buckle-less belt is designed so that it won’t leave “buckle rash” on the back of your musical instruments. Comes in beautiful leather designs and color choices. Belt buckle marks on the back of your guitar are a fact of life, right? Not if you use this hip-looking belt, which, besides keeping your pants up, is a buckle-less design that won’t dig into your guitar as you flail about the stage. 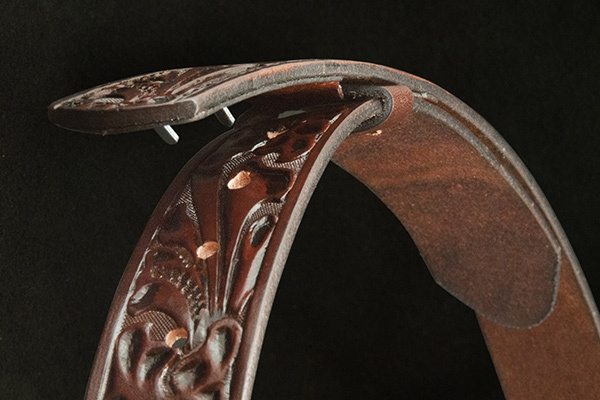 The belt is hand cut from thick cowhide and has no synthetic components; there are just two hidden metal prongs on the back of the stitched “buckle” section that keep it securely fastened. The buckle-less belt designed for musician that won't leave "buckle rash" on the back of your musical instruments. Sign up for our newsletter, we won't sell your information, and you can unsubscribe any time. © 2000 - A&T Leather, Inc.